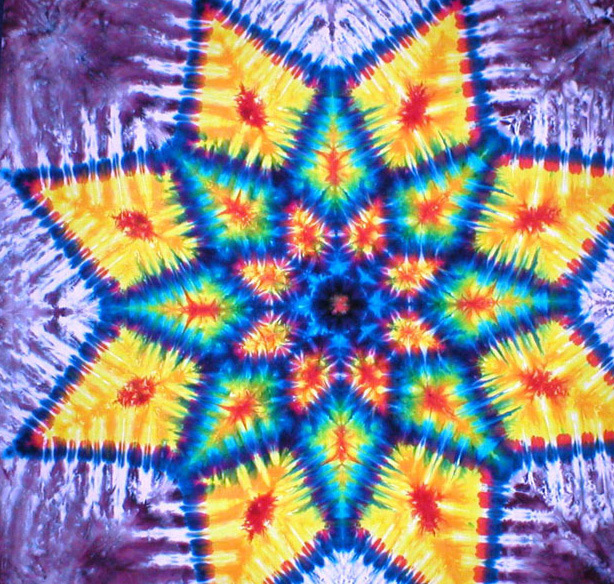 Download "Working with Color & Tie Dye"
3 What is Color? What is Color? White Light Glass Prism Red Orange Yellow Green Blue Indigo Violet Color comes from light. When light hits an object some of it bounces off and is reflected at certain wavelengths. This light interacts in the eye with special light receptors that talk to your brain and tell you what you are seeing. Different colors are made by different WAVE- LENGTHS of light, as humans we only see a small part of the spectrum, insects and other animals see different parts that may not show them color but will let them see things in the dark. Light from the sun includes light that travels at all wavelengths in the visible spectrum, when the full spectrum of light is reflected back we see white. When the full is absorbed or soaks in, we see black. When the spectrum is split into its different wavelengths then we can see colors, this is what happens when you see rainbows. Water droplets in the clouds break up sunlight into different wavelengths and then we can see a rainbow. Glass prisms (like on a chandelier) also break light into rainbows. There are two basic ways by which we can see colors. Either an object can directly emit light waves in the frequency of the observed color, or an object can absorb all other frequencies, reflecting back to your eye only the light wave, or combination of light waves, that appears as the observed color. For example, to see a yellow object, either the object is directly emitting light waves in the yellow frequency, or it is absorbing the blue part of the spectrum and reflecting the red and green parts back to your eye, which perceives the combined frequencies as yellow. 8 PRINT NOW Using only primary colors (flourescent markers work best for this), color the blank t-shirt below how you want your shirt to look. How will the colors mix on the shirt? After a wave passes through a medium, how does the position of that medium compare to its original position? Light Waves Test Question Bank Standard/Advanced Name: Question 1 (1 point) The electromagnetic waves with the highest frequencies are called A. radio waves. B. gamma rays. C. X-rays. D. visible light. Name The Relationship Between Wavelength and Frequency in the Electromagnetic Spectrum Purpose: To discover and verify the relationship between Wavelength and Frequency of the Electromagnetic Spectrum. 6 th Grade UV. Friend or Foe. The student will understand where ultraviolet light (UV) fits in the spectrum of light and its affects on all life. Lessons 1-15: Science in the First Day of the Creation Week. Lesson 1: Let There Be Light! STOP for science. Light is a wave. Like waves in water, it can be characterized by a wavelength. Experiment 11. Color. Observe the transmission properties of the three additive primary color filters and the three subtractive primary color filters. Color Talk Every color has several dimensions. The following chart shows various words used to describe the characteristics of color. HHF-MWB.148 Color Basics Color is a powerful design tool that affects a room s appearance as well as your feelings. It surrounds us, intrigues us and excites us! We plan for its use in our homes and workplaces. Chapter 5. Chapter 5. Objectives Analyze the flow of energy through living systems. (5.1) New Vocabulary. Vocabulary Review. Chapter 5. Ok, so what are the Primary Colors? CULTURAL HISTORY Primary Colors - Part 1 of 2 by Neal McLain Since grade school art classes, we've been taught that the primary colors are red, yellow, and blue (RYB). Teacher s Resource. 2. The student will see the images reversed left to right. Item: 85023001, Artemis Plant Watercolors 25 ml - carmine red CEO. Item: 85023002, Artemis Plant Watercolors 25 ml - vermilion CEO. Item: 85023003, Artemis Plant Watercolors 25 ml - kamala orange CEO.